Active Voice Lab helps foundations, individual donors, and organizations make informed decisions about investment in creative media for innovation and impact — especially when impact is the priority. We bring over 20 years of on-the-ground expertise to each unique inquiry. 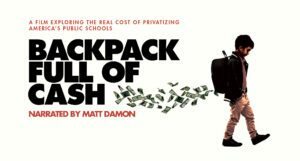 How can two potent stories about the privatization of education become a rallying cry for communities across the country to fight for education equity? Active Voice Lab is working with two filmmaking teams, two media-savvy foundations, and hundreds of parent- and community-led organizations to craft a multi year strategy to advance discourse and action around education equity through a system-based lens. Read more about the Story, Education and Equity Initiative. Assignment: How is a Lab supporting genuine collaborations among social entrepreneurs, storytellers, and funders, while protecting artistic excellence? Assignment: What does the concept of “trust-based philanthropy” mean to social change grantees, funders, and movement builders? Assignment: How can documentary filmmakers, program strands, channels, and stations collaborate to advance public media’s mission and service? Assignment: How can a global foundation leverage the power of documentaries across borders and over time? Assignment: What is Narrative Change, who’s working in the field, and how might a foundation contribute to sustained creative strategies? Assignment: Why do most partnerships need a Prenup? What should creatives and advocates know about each other before they tie the knot? Assignment: How can foundations and grassroots allies leverage “entertainment that inspires and compels social change”? Assignment: What strategic approaches to media grantmaking might support the growing social entrepreneurship movement? Assignment How does a foundation navigate the path between story and change? Assignment: How can funders use film and other media to build awareness and help shape fair and humane public policies? Learn more about ACTivate, our online campaign planning tool. "The Active Voice Lab helped us put our early work into a larger strategic context, which set the stage for growth and collaboration and remains relevant to this day." "Ellen Schneider is one of the nation’s leading thinkers on how story and action come together to stimulate social change. She’s a passionate practitioner, a careful strategist and a trusted thought leader who is respected by filmmakers, community activists, think tank leaders, and philanthropists because she’s been on the leading edge of innovation for more than a decade."